Carche Salon was the perfect setting for the new beauty and healthy cocktails with Hyaluron presented by Riel`s World on Nov 10, 2017. The guests enjoyed their beauty and healthy cocktails al fresco at the Carche Salon's lounge. The beauty cocktails with Hyaluron were presented by Riel's world a leading company in regards to lifestyle worldwide and have many perks like wrinkle reduction, improved skin hydration, and elasticity, among other benefits. Enjoy the gallery with the event highlights! Riel's World is a multinational company that operates in many countries around the world by the hands a professional multinational team with expertise in every needed discipline. Riel’s World is specialized in a wide array of product lines while giving a special focus to their main goal, delighting your senses for what they offer the highest quality available products as they are exotic wines and Champagne, a healthy line with tea, coffee and nutritious products and home fragrances, clothes & accessories. Their goal is as big as it gets, aiming to be there in every happy moment around the world, celebrating diversity and joy as their main values. Hair & Beauty Salon: Their location and venue are absolutely fabulous as you can clearly see in the images. decorated with impeccable taste, offering a welcoming atmosphere in a glamorous and discrete setting in the heart of Puerto Banús most stylish area. They are very much up to date with the latest trends and, listening to your needs, far from the cliché of the hairdresser who does whatever he wants, the team of Carche has the expertise to provide you with a truly relaxing moment in a spirit of trust. 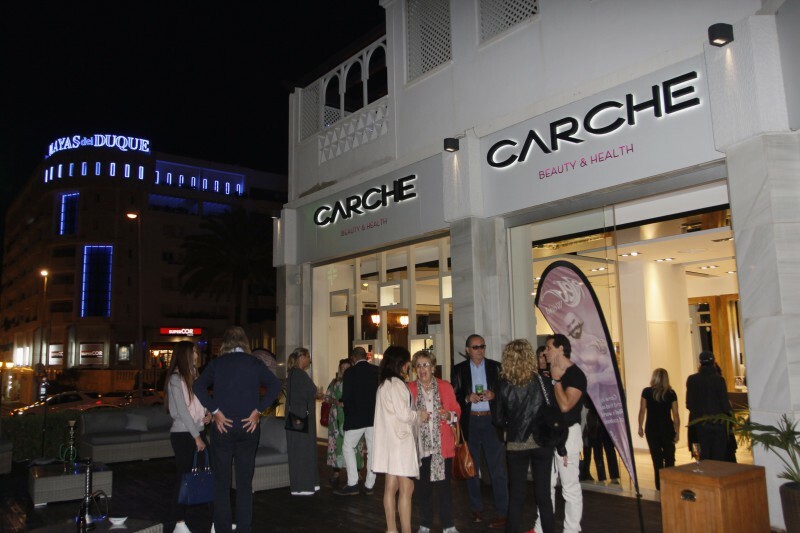 Carche is a highly recommendable Beauty and Health Salon for both men and women. Their staff is respectful, professional and inspired to deliver a tailored style that supports a philosophy of natural beauty enhancement in hair and body care. The beauty cocktails with Hyaluron were presented by Riel's world a leading company in regards to lifestyle worldwide and have many perks like wrinkle reduction, improved skin hydration and elasticity, among other benefits. Enjoy the gallery with the event highlights! They are very much up to date with the latest trends and, listening to your needs, far from the cliché of the hairdresser who does whatever he wants, the team of Carche have the expertise to provide you with a truly relaxing moment in a spirit of trust.